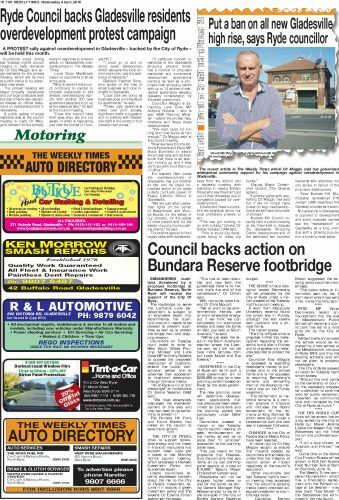 ENDANGERED bushland threatened by a proposed footbridge at Bundarra Reserve, North Ryde will receive the support of the City Of Ryde. The footbridge to serve the Lachlan’s Lane development is subject to an engineers report that recommends the bushland around it needs to be cleared to prevent bushfires as well as to protect the bridge from bird dropping erosion. Councillors on Tuesday night voted to write to New South Wales Planning Minister and Lane Cove MP Anthony Roberts to oppose the proposed destruction of bushland, extend the public consultation period and to advertise their opposition to bushland destruction through the local media. “All of Ryde is full of bird droppings!” an incredulous Clr Sarkis Yedelian OAM said. The Hunters Hill Flora and Fauna Society had called on the council to save the bushland. THE CITY OF RYDE’s drive to support renewable energy and not invest in financial institutions that support fossil fuels got a boost at last Monday night’s council meeting, which endorsed a Revised Investment Policy and Guidelines report. Liberal councillors recently expressed concern about the risk to the City of Ryde’s investment returns if it adopts a green investment policy and The Greens Clr Edwina Clifton welcomed the report. “This has all been about risk and now (with the guidelines) there is no risk and that’s the end of the conversation,” Clr Clifton said. Well, not quite, says Liberal Clr Chris Moujalli. “We all want to be environmentally friendly, we all want renewable energy but if we think we can completely run alternative energy and keep the lights on well, just look at South Australia,” he said. RATEPAYERS in the City of Ryde will be hit with a state government bill of $230,000 to pay for a new planning panel imposed on Ryde by the state government. The new planning panel will determine development applications that had previously been determined by councillors and the planning panels are compulsory under NSW Law passed in December. Councillors passed a motion at last Tuesday night’s council meeting to seek reimbursement for the money as well as to state their “in principle” opposition to the planning panel laws. “I’ve just heard on the grapevine that Hawkesbury Council only had two items on its last planning panel agenda at a cost of $10,000,” Deputy Mayor Christopher Gordon said. Ratepayers will not be slugged higher rates to pay for the panel, as Acting General Manager Roy Newsome said funds for it are available in the City of Ryde’s General Revenue budget. THE GRAVE of local aboriginal leader Bennelong will be protected by the City of Ryde under a motion passed at last Tuesday night’s council meeting. A team from Macquarie University recently found the grave site in Putney, although the site covers both parkland and a private home. Councillor Roy Maggio is opposed to spending ratepayer’s money to purchase land at the private home and is not opposed to resuming Bennelong’s remains and reinterring them at the Aboriginal memorial site on the Putney waterfront. The reinterment of historical remains is a common practice in England and includes the recent reinterment of the remains of King Richard III, which were found under a Leicester car park and now rest in Leicester Cathedral. CHANGES to the City of Ryde’s Social Media Policy have been rejected. A motion put by Clr Roy Maggio sought to ensure that material posted by councillors online does not undermine the integrity of council action or impact negatively of the council’s reputation. Other councillors told last Tuesday night’s council meeting they accepted that the council’s existing media policy provided adequate protection to council’s reputation. Councillor Trenton Brown suggested the existing policy could be modernised. RYDE MP Victor Dominello’s recent announcement that the site of Meadowbank Public School will become a public park has led to a land grab bid by the City of Ryde. Mr Dominello announced the school would be replaced by a new school at the Meadowbank campus of Ryde TAFE and that the existing school’s land will not be given to property developers. THE FIFA WORLD CUP finals will be shown live on a big screen by the City of Ryde but Mayor Jerome Laxale confessed that the Socceroos will not have his full and undivided support. “I am a dual citizen, of Australia and France, so I’ll be torn in my support,” he said. Game One of the World Cup Finals in Russia will be shown at ELS Hall Sports Field Number Two at 8pm on Saturday, June 6. The Weekly Times wonders if Hunters Hill – which has a Friendship Agreement with the Parisian village of Le Vesinet – may also back “Les Blues” if the Socceroos are eliminated in the first round.